I don’t normally review bars as, although a lot of them do pretty good coffee, the like-for-like comparisons to cafes doesn’t work. Bars are more about big, brash external experiences – alcohol, lights, music, dancing – while cafes are smaller, more internal – reading a book, relaxing with friends, getting away from the world. However, if you want a coffee in certain areas of London your choice is either a bar, restaurant or chain. 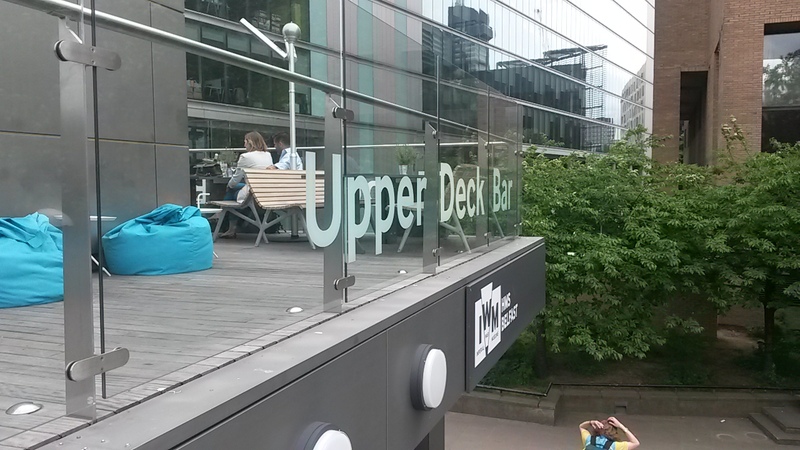 Certain areas of the Southbank fall into this category, so while searching for a cafe I stumbled upon The Upper Deck Bar, which is part of the HMS Belfast. For a tourist attraction cafe this serves a very good cup of coffee. Well made with a good foam and decent kick. However, the flavours were pretty one note and it could have been stronger. Still, if you’re stuck in the area it is better than going to a chain. Also, the cups were possibly my favourite design yet. See the photo above and below. 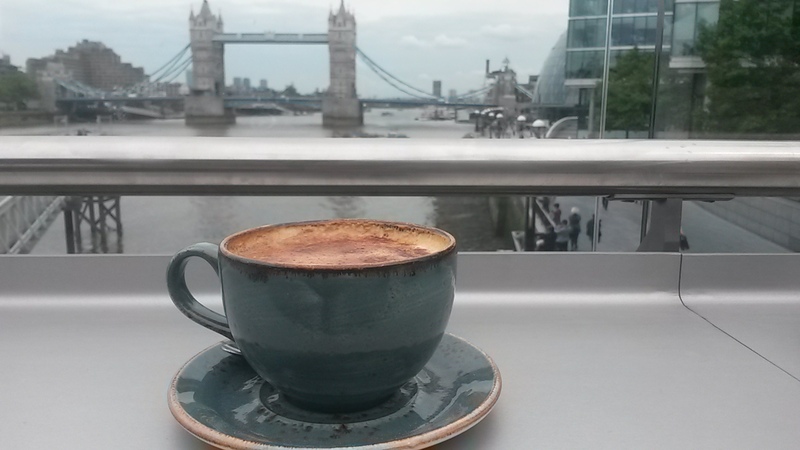 This might have some of the best views of London from any cafe. Sat over the Thames, this is the perfect place to check out London’s sites. The cafe itself is also very nicely done. Stylish with a hint of the south of France, it is comfortable and cool. While all the seating is outside, there is a large umbrella covering the centre and heaters to keep you warm on the English summer evenings. Going with the outdoors, riverside feel the menu is based around the BBQ behind the bar. While the choices are pretty limited, it does also offer a few bar snacks and a cheeseboard to share. The coffees did take a while to reach us but the service was done with a smile, which is more than could be said for some tourist hot spots. Not much – apart from the HMS Belfast, but as you have to pay to go in, it feels unfair classing it as an extra. It does serve wine and is open late. Even if it wasn’t attached to the HMS Belfast I’d still go here. 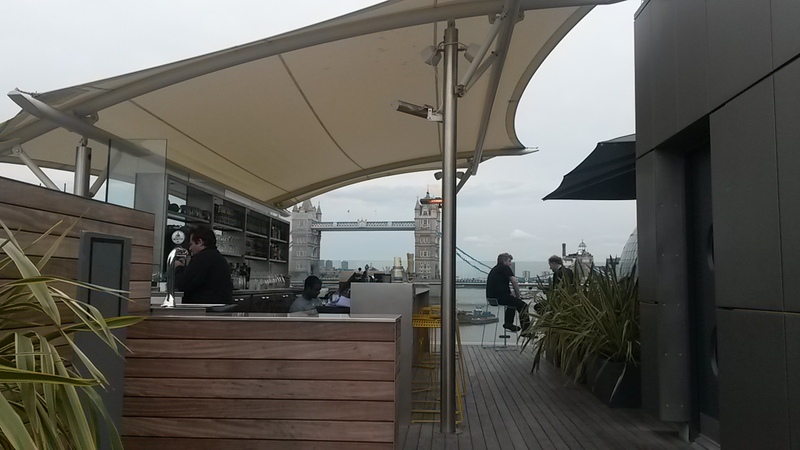 Stylishly designed with great views of City Hall, HMS Belfast and Tower Bridge, it’s a great find for a summers’ day.